There’s not doubt Adams holds a strong position in the hybrid club market segment and their latest introduction is a logical improvement to last year’s models. The new Idea Tech V4 line also includes irons designed for mid to high handicap players. Characteristic time measures how long the ball and clubhead stay in contact so in theory the higher CT is the higher the coefficient of restitution, the more trampoline effect the club will have and the farther the ball will go. The original Velocity Slot Technology in the Idea a12 OS hybrids there was an increase in CT of 20% vs. the Idea Tech V3 hybrids so the new Tech V4 design is a large improvement. In the Tech V4 hybrids the Velocity Slots are in the crown and sole plus there is a channel that cut through the head of the club from the crown slot to the sole slot which produces even more face deflection. 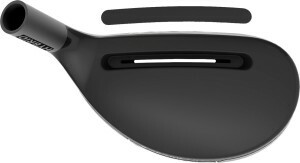 In order to be in conformance with USGA regulations the channel has a plastic inset to seal it but the insert also improves the sound and feel of the club. Two different sets are available in the Tech V4, a forged set with 3H, 4H, 5H and 6-iron through PW in nickel plated carbon steel and an all-hybrid set with 4H through GW. 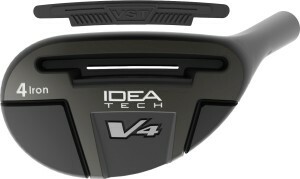 Availability is October 1 and Idea Tech V4 iron sets will have a SRP of $899.99 (steel shafts) and $1099.99 (graphite shafts) plus Idea Tech V4 Hybrids are at a SRP of $249.99.